The ISB GPA Dual Safety Valves are designed with an intrinsically dynamic safety control system that meets or exceeds European Standard EN-692, OSHA and ANSI Requirements for use on pneumatically operated power presses. These dual safety valves are ruggedly constructed and have European Safety Certification that exceeds many of the other competitive brands of valves on the market, and yet the GPA Valves are affordably priced. 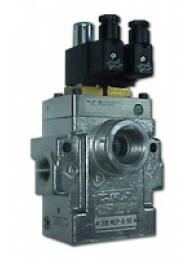 The ISB Valves continuously internally monitor themselves with each operation. In the event that the valve detects a malfunction, the valve will self-lock and will only reset itself when power is removed and the normal operation is restored. 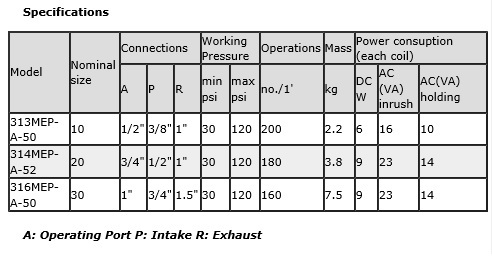 An auxiliary external pressure monitoring system with manual reset is available as an option. Two optional pressure switches are required for this option. The ½", ¾" and 1" Valves are available in stock for immediate delivery. Dual Safety Valves are supplied standard with 120VAC Solenoids and connectors with built-in varistors. Optional 24VDC Solenoids can be provided. The ISB Valves continuously internally monitor themselves with each operation. In the even..
314MEPA52 3/4" GPA Valve (3/4" operating port, 1/2" supply port, 1" exhaust port, 110VAC). The ISB G..
316MEPA50 1"GPA Valve (1" operating port, 1/2" supply port, 1.5" exhaust port, 110VAC). The ISB GPA ..